Seville has played host to two major international exhibitions in the last 100 years, the 1929 Spanish American exhibition, mainly intended to promote the commonwealth of Spain and the former Spanish colonies in Latin America (but also including the US, Portugal and Brazil), and the 1992 Universal Exhibition commemorating the 500th anniversary of the discovery of America by Christopher Columbus. Perhaps surprisingly, given that it’s further back in time, it’s the site and remaining buildings of the 1929 exhibition that are of the greatest interest to the visitor. 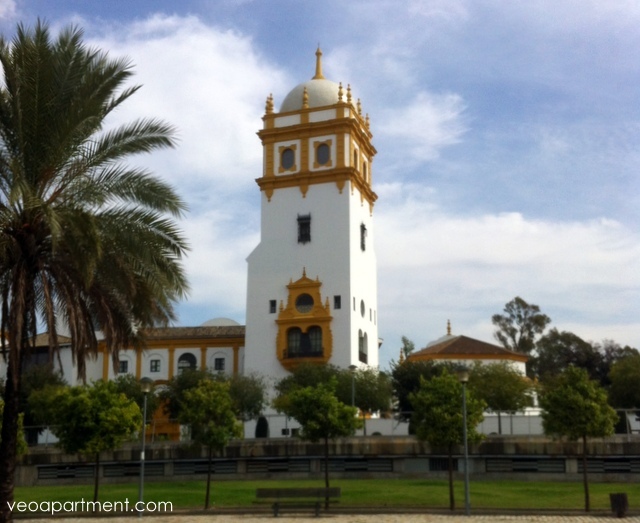 It is, of course, much closer to the city centre, but the site is also in and around Seville’s largest park, the Maria Luisa. 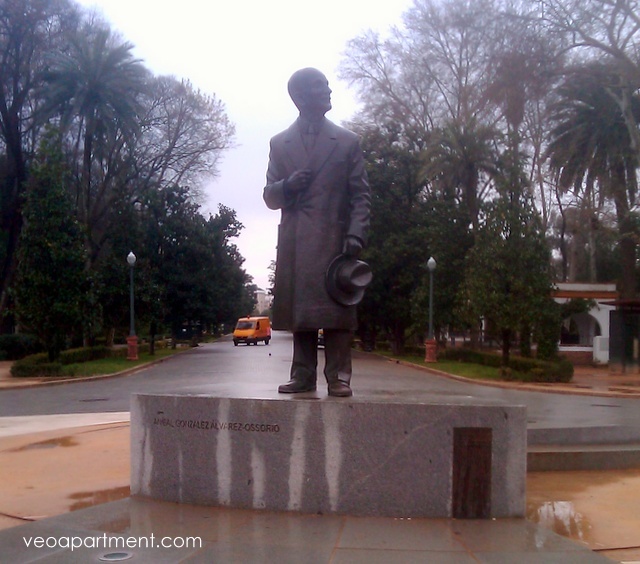 The park was once the gardens of the Palacio San Telmo, but was donated to the city in 1893. 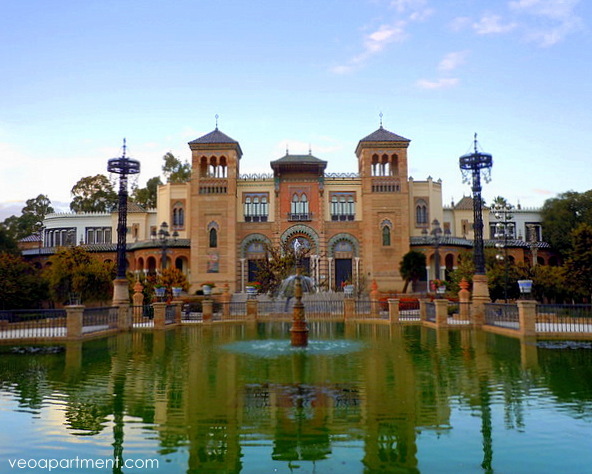 Following the 1910 decision to hold an exhibition in Seville, the gardens were remodelled by the famous landscape gardener Jean-Claude Forestier, and in 1914 Anibal González, the architect in charge of the project, began construction work on the pavilions. Eighteen countries took part, and although many of the minor buildings have gone, most of the national pavilions, many of which were intended to become consulates of their respective countries after the expo finished in June 1930, are still in use, together with some of the other principal pavilions, and can be found either in or near the park, and along the Paseo de las Delicias. 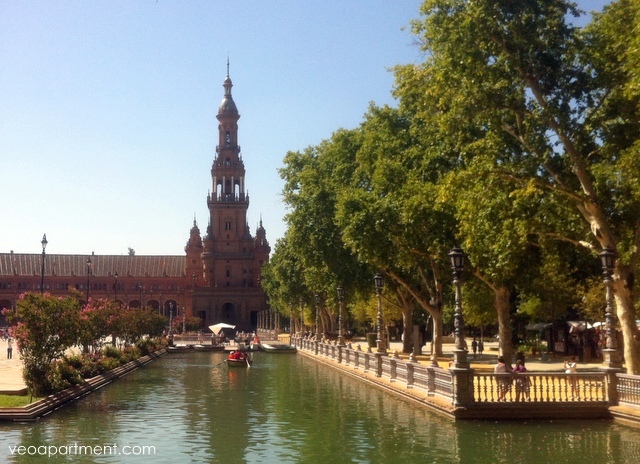 The park itself is Seville’s largest green space, and was designed as a “Moorish Paradise”, with ponds, pavilions and walkways, and the famous Fountains of the Frogs and the Lions. The centrepiece of the exhibition was the Plaza España and the surrounding semicircle of the Spanish pavilion. Built in a mixture of art deco and neo-Mudejar (an early 20th century revival of late Moorish architecture), this held the largest Spanish exhibit, the Salon of Discoveries, about the exploration of the New World. Nowadays the building mostly houses government offices, as well as a small military museum. In front of the pavilion are the forty alcoves representing all the provinces of Spain, with illustrations in ceramic tiles of important scenes from their histories. The four bridges across the boating lake to the Plaza represent the four ancient kingdoms of Spain. Everything is decorated in a profusion of tiles showcasing the craftsmanship of Seville’s ceramics industry. Not surprisingly the complex has featured in a number of films, including Star Wars – Attack of the Clones, Lawrence of Arabia and The Dictator. Other important buildings in the park include the Palacio Mudejar (now the Museum of Popular Culture), the Palacio Renacimiento (now the Archaeological Museum), and the Palacio de la Casa Real, all in the Plaza America at the far end of the park, and the horseshoe shaped pavilion of the Telephone Company (now the Gardening School), just beyond the Plaza España. Prominent among the national pavilions, and worth looking out for, are those of Portugal (next to the Prado San Sebastian), Peru (now the Casa de las Ciencias), and those of Argentina and Mexico (both now used as schools) on the Paseo de las Delicias. Preparations for the 1929 exhibition also included the building of new hotels (most notably the splendid Alfonso XIII for the Royal family and visiting heads of state), the widening of many streets, including what is now the Avenida de la Constitución, and the refurbishment of the old Jewish quarter as a tourist attraction. 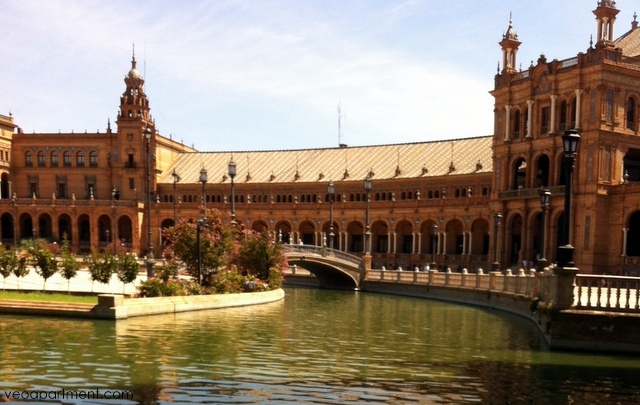 This area is a perfect place to rent an apartment to explore the old expo site and Seville’s other principal monuments.